Beginning pupation. Note how the leaf and stem have been reinforced with black silk. 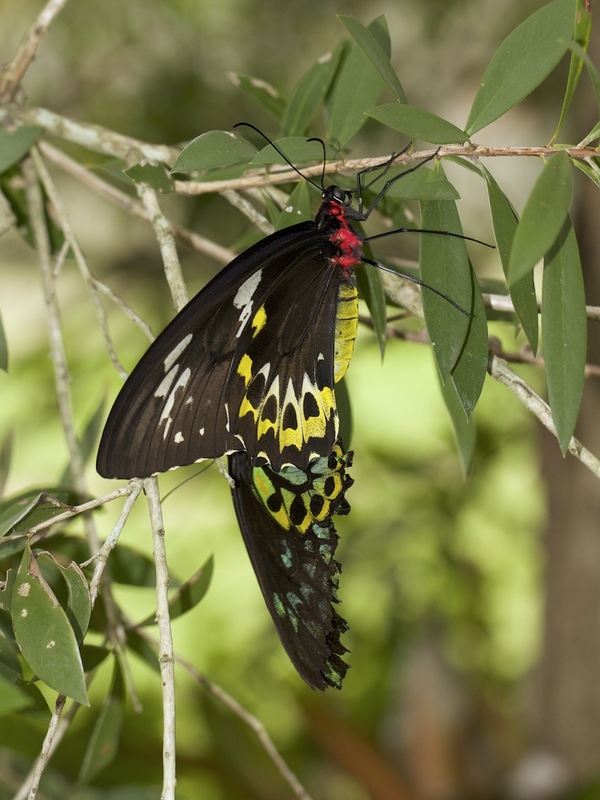 I have been writing about Cairns Birdwing butterflies quite often but there are still more things to say (and our visitors always seem delighted and fascinated by them) so I will keep adding to the story. Pupation, the process of forming the chrysalis, changing inside it and emerging as an adult, is one of the most baffling processes in nature. I’m not even going to speculate about how an insect could have evolved such a bizarre practice but want to share my observations of the beginning and end of it. 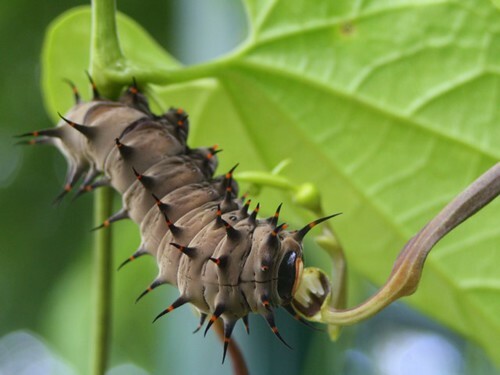 Birdwing caterpillars eat until they are big enough and then leave the vine they have been feeding on and attach themselves to a nearby plant, often a metre or two off the ground (sometimes they drop from the vine to the ground to crawl up the stem of another plant). The one in my first photo chose the twig of a rose bush and I was intrigued to see that it reinforced the rose with strands of silk running down from the branch, over the leaf and around the twig – a sensible precaution against the leaf falling off, of course, but again one has to wonder how it evolved (as usual, click the photo to see it better). It then made a silk sling from the plant around what would be its shoulders if it had shoulders, and hung tail down for a surprisingly long period – a couple of days. But how do they get into their chrysalis? I have to admit to relying on vague memories of silkworms, but those memories put me on the wrong track entirely because they don’t “get into” the chrysalis at all. Rather, they form it under their skin, then shed the skin just as they have already done several times during their growth as a caterpillar. 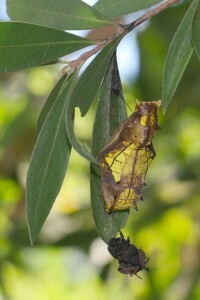 A very new chrysalis, with the discarded skin still dangling from it. I actually woke up to that – and to my own ignorance – when I saw a fresh chrysalis, not yet hardened, flexing to shrug off the last part of its skin. 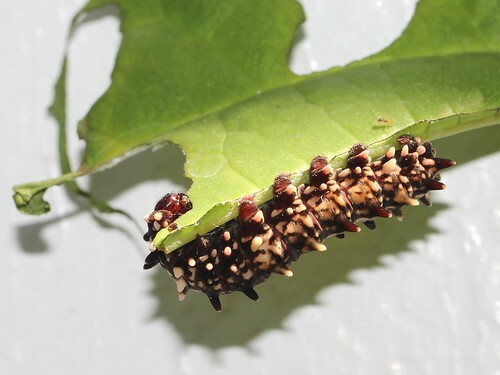 In this second photo (not the same caterpillar, of course) you can see the crumpled skin, complete with head-shell and legs, still barely attached to the chrysalis. A related point is the difference between a chrysalis and a cocoon. As Museum Victoria point out here, “the skin that emerges from under the old skin is a chrysalis. 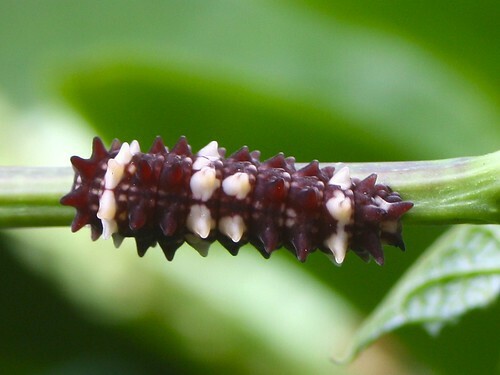 Both butterflies and moths develop a chrysalis in their pupal stage, but the chrysalises of moths are usually contained inside a woven structure made of silk – a cocoon.” Silkworms are the caterpillars of moths so they form cocoons around their chrysalises in just this way – see Wikipedia for more information. 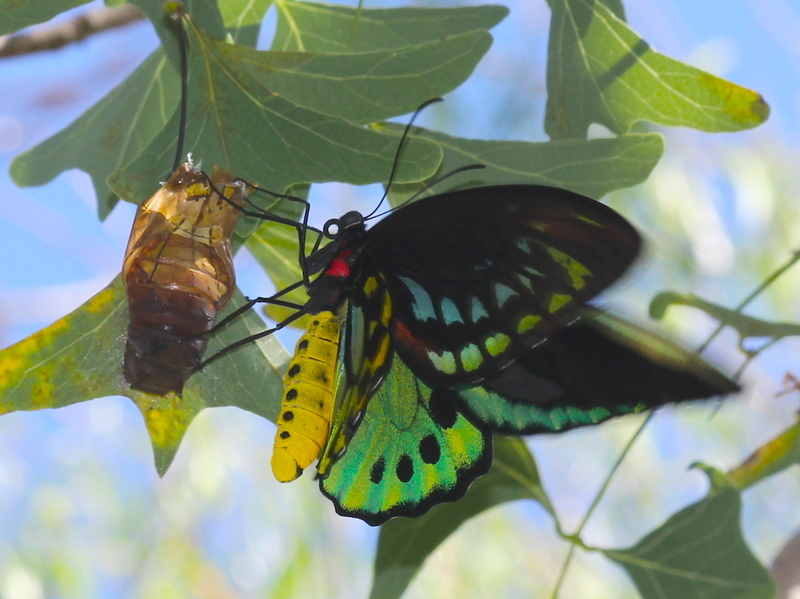 The really mysterious stuff happens in the chrysalis, over the next month or so in the case of our Birdwings, and then the chrysalis splits and a damp butterfly emerges with crumpled wings. As soon as they straighten and harden, she – or he, as seen below – is off and away in search of nectar or a mate. 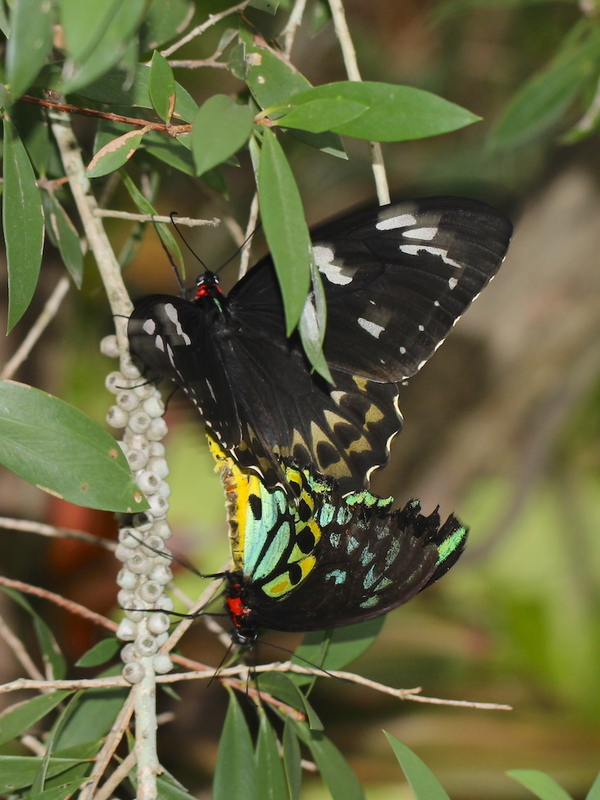 Three weeks ago I wrote about the collection of Cairns Birdwing chrysalises we found on our bottlebrush tree and observed that we should be seeing the adults emerging “around the end of the month.” They have been appearing for a few days now, so it seems that some of the chrysalises were a bit older than we thought. Normal courtship involves the hopeful male flying close below and behind the larger, darker female as seen here and doing aerobatic tricks around her; if she is impressed enough, she will allow mating to begin. 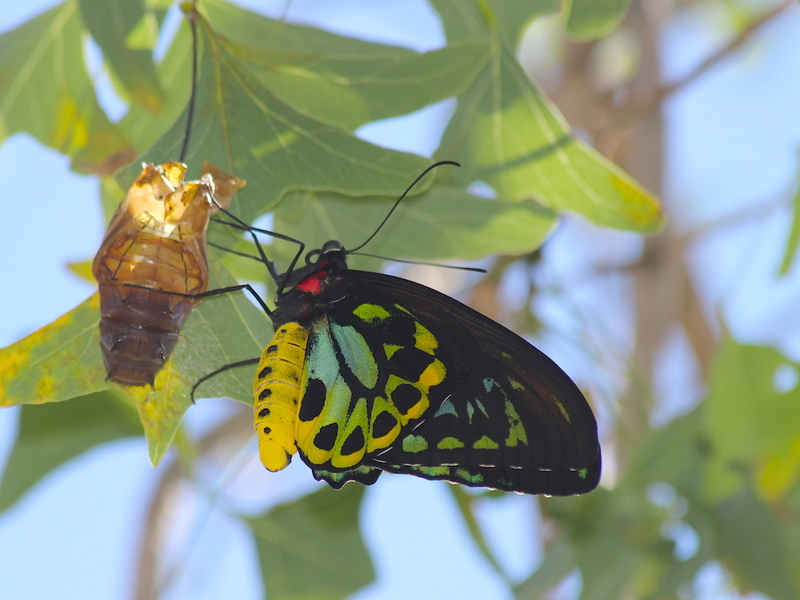 However, males have no compunction whatever about taking advantage of a female who is still waiting for her wings to stretch and dry after squeezing out of her chrysalis, and that is what has happened in the photo above. 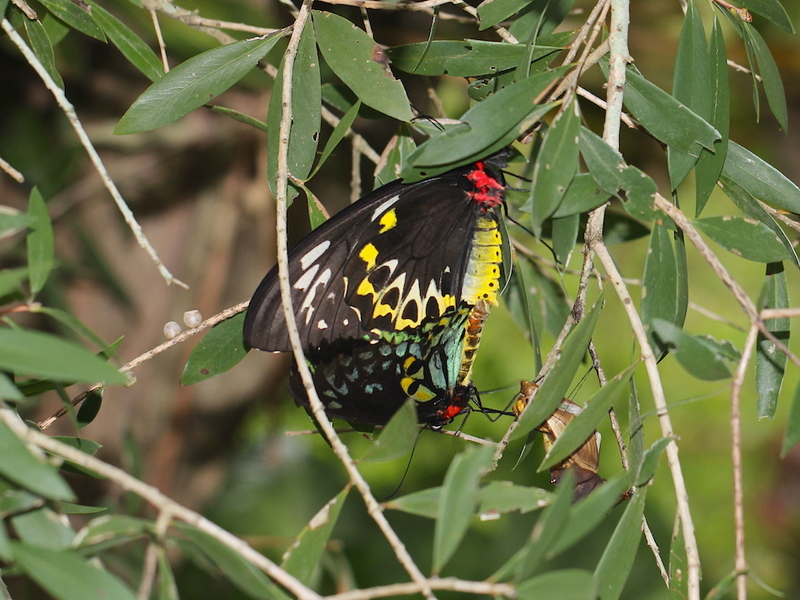 As her strength increased, she fluttered and crawled higher in the foliage, dragging him with her. This happened late yesterday afternoon and was the second emergence we saw during the day. 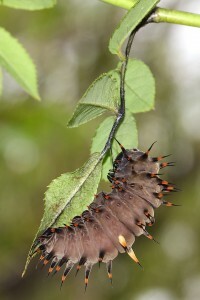 Meanwhile, we still have half-grown caterpillars in the garden, and others full-grown and beginning pupation. I checked on the seasonality of the species and Braby’s huge, authoritative Butterflies of Australia said that adults appear all year round but chrysalises can lie dormant for some months in the dry season. That makes sense, since there is no point emerging as an adult when the caterpillars’ food plants are not growing well. Don Herbison-Evans’ page about the species lists their food plants and provides links to information about them. 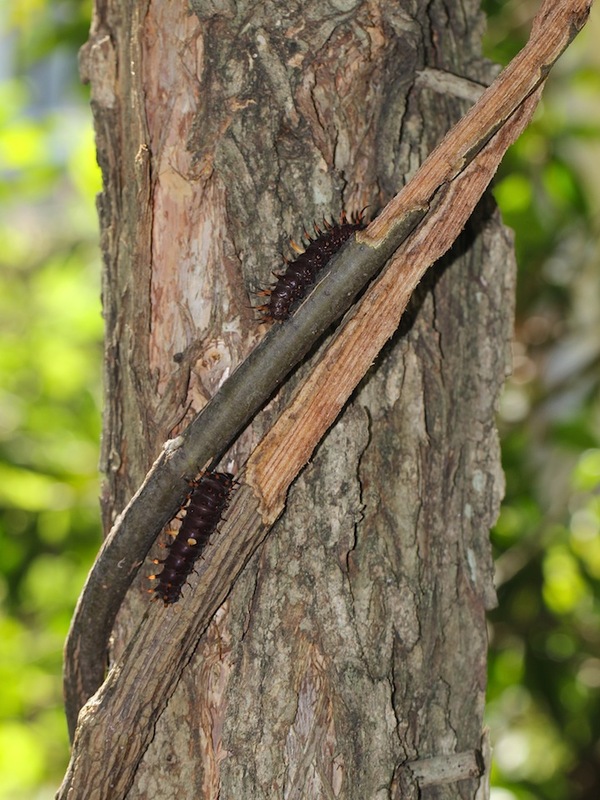 Our caterpillars have been eating the bark of the main stems of our largest surviving vine and (once again) we would love to hear from people who have more Aristolochia. I’m sure that if we gave away all the caterpillars we could find we would still have more than we can feed. 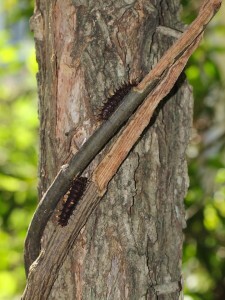 The caterpillars change colour and pattern as they grow. The three below are all Clearwing caterpillars, at early, middle and late stages of development. Cairns Birdwing caterpillars (Troides euphorion) also depend on Aristolochia – four native species of it, in fact. 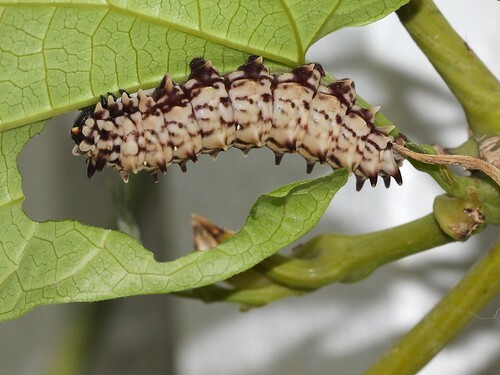 However, there is only one species that both kinds of caterpillars like: Aristolochia tagala. 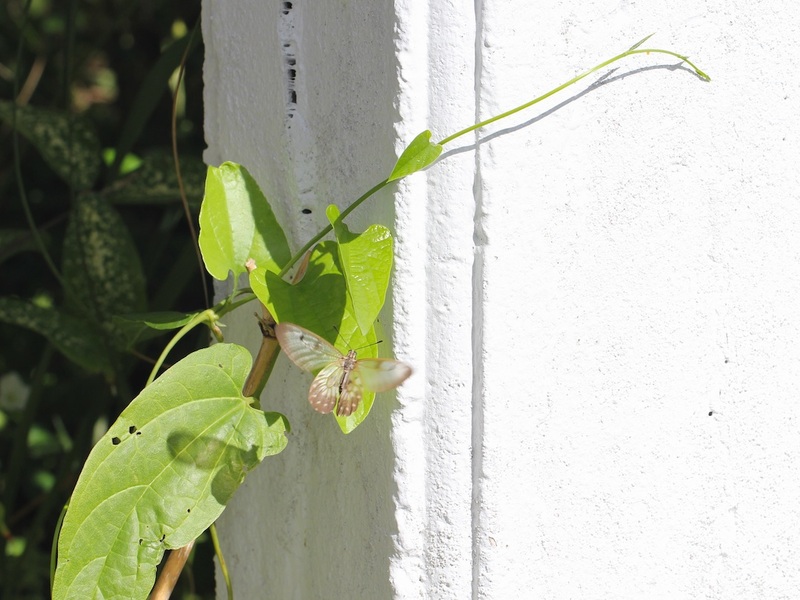 Recently we have had both species of butterfly laying eggs on our vines and we can’t grow enough of them to feed all the caterpillars that hatch. It’s a continuation, really, of the situation we had back in May. 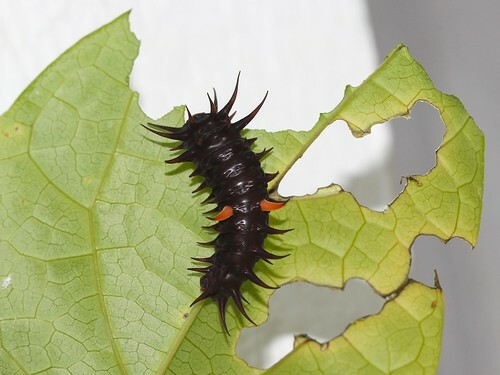 Part of the problem is that a single caterpillar can consume a whole vine seedling within a day so we have difficulty rearing a vine past its infancy; we may have to begin growing them under wire mesh until they are well established.